Real inside joke. Inside enough to hit the batter. Thanks to my buddy Prox for helping with the logo. About a year and a half ago I had an idea. Why don’t I have a game day party and theme it like a convention? I had no previous convention experience, but I had certainly read stories and seen pictures. Simple enough, right? I gave it a name, Gwarkoni-Con (another story), threw together some door prizes, bought some name tags and sent out invitations. People actually showed, were great sports about the theme (read, they didn’t complain too much about the name tags), seemed to like the door prizes, and in general a good time was had by all. Gwarkoni-Con was a thing. This got me thinking; maybe I should go ahead and give conventions a day in court? You see, I am not against conventions by any stretch of the imagination. On the contrary, in my mind they sound like marvelous events filled with gaming, costumes, vendors, and much revelry. The realty though, regardless of the event, is when corralled with a bunch of people (whether they are like-minded or not) with the same basic intention, direction, or goal, I tend to get annoyed after a while. Please know I understand this is my problem, not theirs. Well, mostly not theirs. I decided to stay local; start slow. Baby convention steps, if you will. I live in the St. Louis area and because of all the great things I heard from my gaming friends, I chose Geekway to the West. It seemed large enough to get the “big convention” feel (over 1000 attendees this year) and the price was right. If I went running out the door screaming, much like my lifelong experience with haunted houses, I wouldn’t be out too much money. 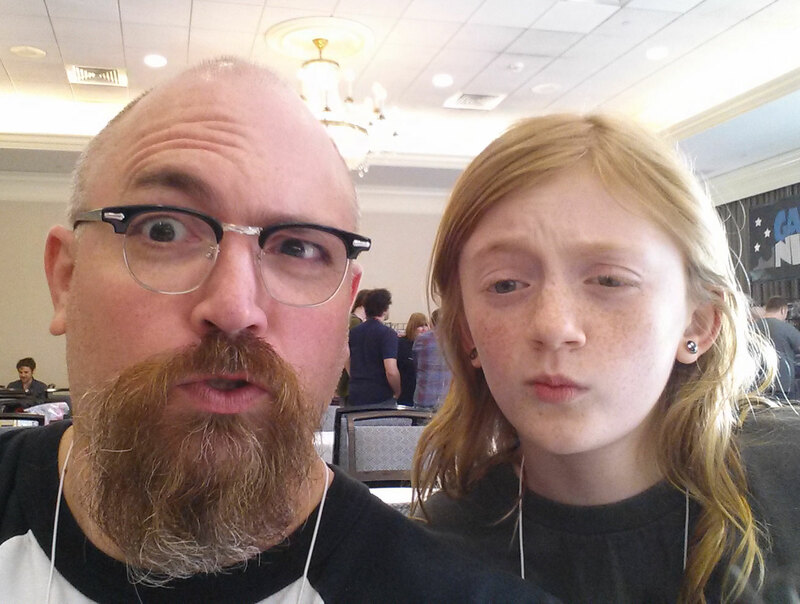 I went to the site and registered for two passes; my oldest daughter would go along with me. The other thing, for whatever irrational reason, that had me hung up about the idea of conventions (and one like Geekway) was a whole slew of people, packed into a large, confined space, playing games. A perfectly noble pursuit, mind you, but one that I couldn’t wrap my head around. Four days, that’s all you do? It seemed like a long time. It sounds like I don’t like people or gaming, doesn’t it? That’s not it at all. In my sometimes too practical mind, I was telling myself that I could game at my house with people I knew just as effectively. It’s at those times I question any thought I retain about my free spirit or sense of adventure. May 15th, 2014 rolled around and off my daughter and I went, ready to give this whole thing a shot. We arrived early evening, after work. The decision was made and strategy set. We would register, get our free games (our online registrations garnered us two free, randomly selected games), run them to the car and then go check out the gaming area. My daughter, Calliope, was a little cautious about the whole idea of gaming with strangers as well. She was 11 at the time and possibly more interested in shopping the vendors than playing. With the loot secured in our vehicle, we started down the staircase to the gaming area. Not halfway down, we were passed by a two people carrying on a lively conversation about a game previously played. As if a skill check was rolled and failed, they looked our way and said, “Hey you want to play La Boca with us?” I looked at my daughter. She looked at me. Seconds passed. “You want to play or check out the vendors?” I inquired, potentially pawning the weight of the decision on her. “I don’t care,” She double-deferred. Well, played. “Yeah, we’ll play.” I finally responded, probably not all that convincingly. “You can check out the vendors while we set up.” The woman told Calliope, solving any perceived dilemma. It was like they thought of everything. Calliope went and did a quick run through at one of the vendors. At Geekway, the focus seems to be more about playing games than on the vendor experience, but there was a vendor presence and they had a solid variety of games to peruse. I made small talk with our new friends. They were from Iowa and the woman who asked us to play was a teacher who used Dungeons and Dragons to teach math to her students. Calliope came back and we played La Boca. It was easy to learn, a game where you work with a random partner to stack blocks in order to form the shape shown on a challenge card. The rub is that the image you are trying to complete is different from the one your partner needs to create, while using the same blocks. You have to communicate to each other in order to arrange the shapes in a manner that completes both objectives. The game took our focus and aversion away from our preconceived ideas about stranger gaming and we had fun. An abundance of it. And we made friends. Geekway to the West as a whole did the same thing. It was an environment that promoted community and allowed us to enjoy playing games in a way that we never could have had we just stayed home. We finished the game, spent a few minutes chatting about how much fun the game was, how the convention worked, etc. They went their way and we went ours. We played several games and met lots more people. We played Toc Toc Woodsman with a couple from Illinois who decided to come to Geekway to the West this year instead of Gen Con. We played some games by ourselves and watched some games being played by others. We talked a lot, to a lot of different people. It was a school night and we stayed past bedtime. We could only get back for one more day, but we had a blast while we were there. We played with more people we didn’t know, at least until the game was over, then we knew them. We met up with people we did know and played games with them. Play one game, check it back in at the library, check out another. Play. Repeat. The reason I am sharing this is because yesterday we put Gwarkoni-Con II in the books. Twelve hours of gaming at our house with family and friends. This year, we created a logo. We had more door prizes and we again made people wear name tags. As before, folks were good sports and bought into the theme. There were roughly the same number of attendees as the year before, but we had new faces from different parts of our lives. Co-workers, gamers from different groups, and family all huddled around tables, not thinking about who they knew or didn’t. Not all that worried about any preconceived ideas they had what it would be like or who they would meet. We just played games. 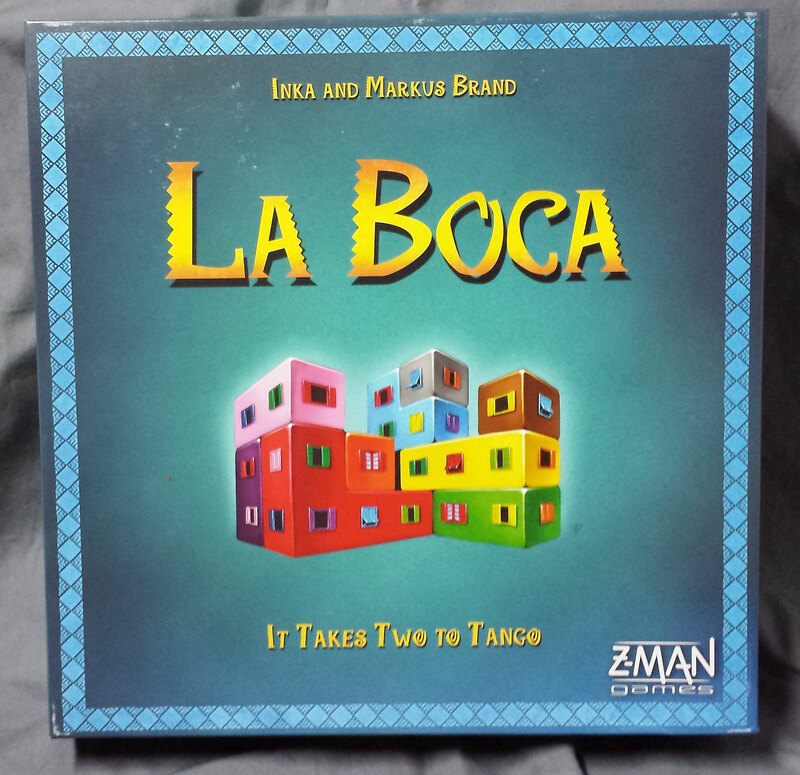 La Boca was put on the table, just like Geekway to the West (we bought it after the convention), and strangers became friends, or at least fellow gamers for the moment. This year, we have already registered for Geekway to the West 2015; four four-day passes. My wife and both daughters are going. I am taking Thursday and Friday off of work. We reserved a hotel room for Friday and Saturday night; the whole shebang. I was talking with my wife this morning, sharing my thoughts on the party and how much fun I had. I found myself explaining to her that our experience at Geekway to the West was so similar to how I felt at our house, with people who are close to us. How inviting, friendly and positive. I can’t wait until Gwarkoni-Con III next year. Maybe this time I will do t-shirts. Until then, I have Geekway to the West to look forward to. The header to their website proclaims, “Four Days of Peace, Love, and Board Games.” It sounds right up my alley. Geekway to the West. Four Days of Peace, Love, and Board Games. Thanks for the kind words. I would love to say hello to them again, and thanks. It’s always funny to me how small things can make a big difference. I hope Gwarkoni-con becomes a real con one day so I can be one of those greybeards telling people I’ve “been to ’em all ya punks!” Also, great post!